From March 7th to May 10th there will be a big contemporary art project held in this beautiful & historical city, Kyoto. For those who can’t live without art, those who casually enjoy gallery hopping and even those who are just looking for an activity that does not involve temples and shrines, this is a perfect opportunity. The following Q & A should explain all the information that is needed to enjoy this tremendous art event. Most of the information is based on the fourth press conference held at the end of January 2015. PARASOPHIA is the first big international contemporary art project held in Kyoto City. This project will be hosted from March 7th to May 10th 2015. According to the director of this project, Shinji Komoto, PARASOPHIA is a hard-to-predict event. This event involves interactions between artists and audiences and will establish a mode of thought and creation in Kyoto which will continue to encourage an open dialogue, leading to cultural assets which could last 10 or even 20 years. Where can you see the displays and how can I get to these spots? The main venues for this event are: Kyoto Municipal Museum of Art and Annex, The Museum of Kyoto. Other than those, Horikawa Housing Complex, Delta point at Kamogawa River, Kyoto Art Center, Books Ogaki Karasuma Sanjo Store and areas near the cross streets of Kawaramachi and Shiokoji Streets also have displays. Check out the map below and plan carefully. The Kyoto Municipal Museum of Art has the most displays, so be sure to allocate enough time for it. Use the subway Tozai Line and get off at Higashiyama Station. Walk east and turn left at the cross streets of Sanjo and Jingumichi Streets. Walk 3-5 mins. The big building on the right side is the Kyoto Municipal Museum of Art. Use the subway Karasuma Line and get off at Karasuma Oike Station (Exit 5 is the best). 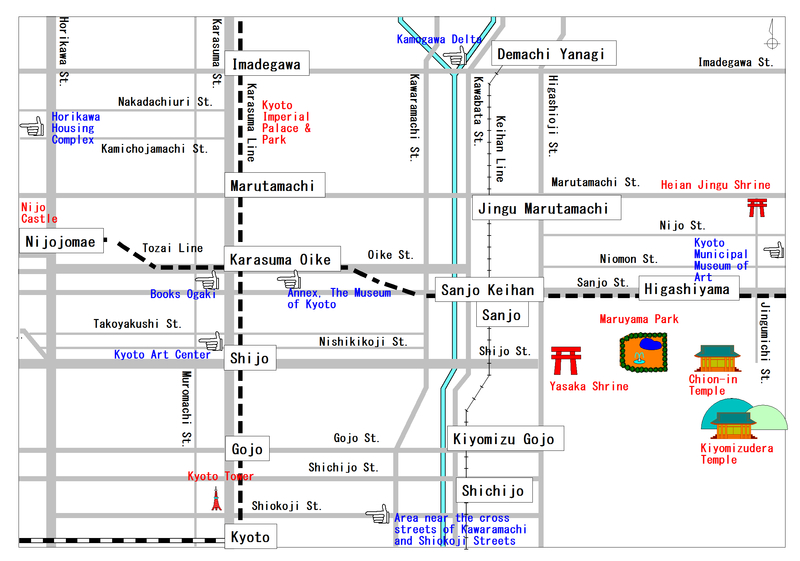 Find Sanjo Street and walk east. Within a few minutes, there will be a retro-looking building on the left side, which is the Museum of Kyoto. At Nijojomae Station on the subway Tozai Line, find Exit 1. Walk past Nijo Castle. Keep walking north (Horikawa Street) while checking the names of the east/west bound streets. After passing Kamichojamachi Street, the old apartment complex on the left side is the venue. From Imadegawa Station on the subway Karasuma Line, find Imadegawa Street and walk east. About 15 mins, the picturesque Kamogawa River will be on sight. Or, at Sanjo Keihan Station on the subway Tozai Line. Change to Keihan Line bounding for Demachi Yanagi (local or express) and get off at Demachi Yanagi Station. Note that the One Day Pass does not cover the Keihan Line, so buy a 210 yen ticket. Take the subway Karasuma Line and get off at Shijo Station. Find Exit 22. Walk north until you hit Nishikikoji Street. Turn left and walk. At the first cross street, turn right. At Karasuma Oike Station, find Exit 6. Walk south for a minute. Check the big window on the bookstore. From JR Kyoto Station, walk north and find Shiokoji Street. Walk east until Kawaramachi Street is in sight. Probably it will take about 20 mins. Useful Tip: As seen on the map, it is wise to move to each spots using the subway Karasuma and Tozai Lines and walking from the nearest stations. The subway stations sell One Day Subway Pass for 600 yen at the ticket machine (or it is sold by station staff for some small stations). It is worth the price especially since it is highly possible to use the subway more than 3 times a day (one ride costs at least 210 yen). Get this pass to save some money. But visiting Horikawa Housing Complex and Delta point at Kamogawa River requires more (or a lot of) walking (20 – 30 minutes walking distance from the nearest stations) than others. Who is going to participate in this project and where can I see their work? There will be about 40 artists. More specifically, Lisa Anne Auerbach (Kyoto Municipal Museum of Art & Bookstore Ogaki Karasuma Sanjo Store), Nairy Baghramian (Kyoto Municipal Museum of Art), Cai Guo-Qiang (Kyoto Municipal Museum of Art), Joost Conjin (Kyoto Municipal Museum of Art), Stan Douglas (Kyoto Municipal Museum of Art), Simon Fujiwara (Kyoto Municipal Museum of Art), Dominique Gonzalez-Foerster (Kyoto Municipal Museum of Art & Annex of Museum of Kyoto), Hoefner/Sachs (Kyoto Municipal Museum of Art & Areas near the cross streets of Kawaramachi and Shiokoji Streets), Hedwig Houben (Kyoto Municipal Museum of Art), Yoshimasa Ishibashi (Kyoto Municipal Museum of Art), Brandt Junceau (Kyoto Municipal Museum of Art & Horikawa Housing Complex), Emiko Kasahara (Kyoto Municipal Museum of Art), William Kentridge (Kyoto Municipal Museum of Art), Ragnar Kjartansson (Kyoto Municipal Museum of Art), Keiko Kurachi & Satoru Takahashi (Kyoto Municipal Museum of Art), Ann Lislegaard (Kyoto Municipal Museum of Art), Tatsuo Majima (Kyoto Municipal Museum of Art), Ahmed Mater (Kyoto Municipal Museum of Art), Aernout Mik (Kyoto Art Center), Yasumasa Morimura (Annex of Museum of Kyoto), Susan Phillipsz (Kyoto Municipal Museum of Art & Delta point at Kamogawa River), Florian Pumhosl (Kyoto Municipal Museum of Art), Pipillotti Rist (Horikawa Housing Complex), Arin Rungjang (Kyoto Municipal Museum of Art), Aki Sasamoto (Horikawa Housing Complex), Gustavo Speridiao (Kyoto Municipal Museum of Art), Tadasu Takamine (Kyoto Municipal Museum of Art), Koki Tanaka (Kyoto Municipal Museum of Art), Ana Torfs (Kyoto Municipal Museum of Art), Rosenmarie Trockel (Kyoto Municipal Museum of Art), Jean-Luc Vilmouth (Kyoto Municipal Museum of Art), Danh Vo (Kyoto Municipal Museum of Art), Hong-Kai Wang (Kyoto Municipal Museum of Art), Xu Tan (Kyoto Municipal Museum of Art), Miwa Yanagi (Kyoto Municipal Museum of Art) and Alexander Zalten (Annex of Museum of Kyoto). It depends on the venue. Art works displayed at Horikawa Housing Complex, Delta point at Kamogawa River, Kyoto Art Center, Bookstore Ogaki Karasuma Sanjo Store and areas near the cross streets of Kawaramachi and Shiokoji Streets are free to see. The two main venues (Kyoto Municipal Museum of Art & Annex of Museum of Kyoto) require visitors to purchase a ticket (1800 yen/adult, 1200 yen/college student, 1200 yen/over 70 y.o, free/younger than high-school students). Where can I get the tickets? Tickets are sold at the tourist information center on the second floor of JR Kyoto Station, Kyoto City’s Transportation Service Offices (in front of JR Kyoto Station (Kyoto Tower side), Kotochika, Kitaoji, Karasuma Oike and Uzumasa Tenjin), Kyoto Art Center, Kyoto Minami Kaikan, Kyoto Aranvert Hotel, Ogaki Bookstores, Gakubuchi no Yamamoto, Kyoto Tokyu Hotel, Junkdo Bookstore Kyoto Store, NADiff, MEDIA SHOP, Roppongi Hills Art & Design Store, etc. For those who live in Japan, be sure to get tickets in advance (by March 6th), because there is discount, at Ticket Pia (P code: 766-551), Lawson Ticket (L code: 56574) and E-Plus. Shinji Komoto, who worked for National Museum of Modern Art, Kyoto as a researcher and a curator, directs this event. He also took important roles in several International art projects such as “Yokohama Triennale2001 Mega Wave”, and worked as an international judge for Golden Lion Pavilion at the 50th Venice Biennale International Art Display. From March 7th to May 10th 2015. How can I find information on PARASOPHIA? Check their official site from here.